Selecting Assessment Types for Your Students - Georgia Department of Education. All rights reserved. 1. Log in to your account at gavirtualschool.org. 2. Click on EOC Weight on the left menu. 3. The active term should be displayed. Click Show Enrollments. 4. 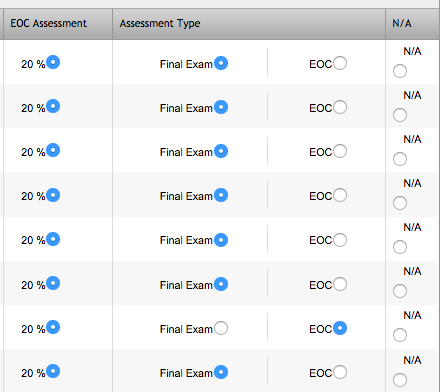 If ALL of your students require to same assessment type, you can select all at the top of the screen. 5. If you need to enter individualized information, select the correct radio button for assessment type next to each student’s name. 6. Review all of your selections. 7. Go back to the top of the page and click SAVE!